Home Book reviews Rhubarb soda.. and a True Brews Giveaway! Rhubarb soda.. and a True Brews Giveaway! I’ve said it before… True Brews is a totally fun book. I’m looking forward to exploring more recipes, like the hard lemonade and the hard cider… maybe even some of the beers but for right now, I’m obsessed with soda. Last weekend, I got a pound and a half of rhubarb in my CSA and immediately thought SODA! Rhubarb is tart and we really do enjoy a less sweet soda so I thought it was perfect. But how does one juice a rhubarb. Emma to the rescue again! I do wish my rhubarb was more pink so that I would have a prettier juice. I actually contemplated putting some red food coloring in there. But I didn’t. The juice sat in the fridge for a few days so the bits that didn’t filter out would settle to the bottom. Which totally worked. I just poured it out into a big bowl and let the sludge stay in the jar. I added lime juice, sugar and pitched the yeast.. then bottled it up! Two days later, I had lovely fizzy, tart rhubarb soda! Developed from the Master Soda Recipe from True Brews: How to Craft Fermented Cider, Beer, Wine, Sake, Soda, Mead, Kefir, and Kombucha at Home . I modified the method to suit my preferences. You wanna know how Emma does it? You gotta get the book! One clean two liter soda bottle or clean 20 ounce soda bottle and three flip top beer bottles. 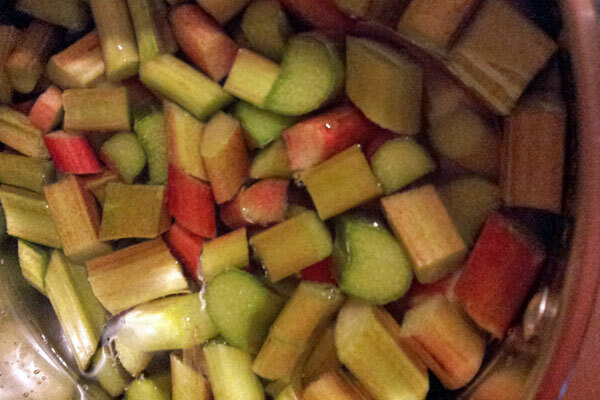 Add the sugar water and lime juice to the rhubarb juice and stir to combine. Taste. Too tart? add sugar. Too sweet? I doubt it, but add lime juice. Combine the yeast and the remaining cup of water and stir to combine. Add the yeast mixture to the juice mixture and stir very well. Bottle, leaving 1 inch of head space and set in a safe place at room temperature. Win a copy of True Brews! Leave me a comment letting me know what you want to try making out of True Brews or why you want this book! Please be sure to fill in the email address field when you comment. Anyone can enter, but please enter only once. You will receive the hard copy of the book, shipped from Amazon.com. DIY, soda, true brews. Bookmark. 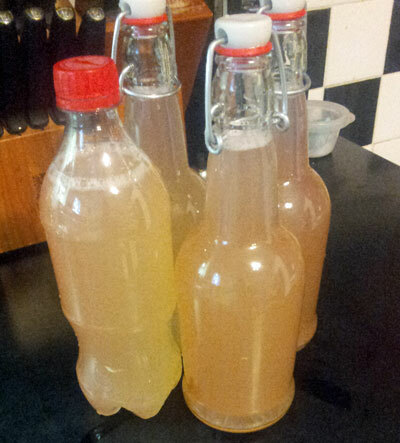 I think that rhubarb soda looks wonderful. Like you, I’m looking for a less-sweet soda. They seem to be more thirst-quenching in the stupidly hot and humid weather. At least to me. I’ve been really inspired by your soda posts! I added the book to my wishlist but haven’t picked it up yet. I’m especially interested in making Jamaican Ginger Beer or even traditional ginger ale – it has to be cheaper than buying Reed’s which is delicious but really expensive! Reed’s is my cure-all beverage, I’d love to be able to make it in-house. I’m a complete newbie when it comes to fermented drinks and this book looks like a really great guide. Hey Jeni, you know I love soda. We’ve always used our soda stream to add fizz but I’m ready for the next step. True ginger ale woul make me queen of the kitchen– and I’m certain would be a hit. I want to try making a soda that I can add things to to make an energy drink. My husband has health issues but continues to drink AMP soda despite knowing what’s in it! He said, that if I can make a soda that gives him the same or close boost as AMP. He’ll quit immediately! If he quits it will solve a few problems and help his ADD! Plus I want to make soda and lemonade for the whole family because we all love soda but hate what it’s made of! Thanks! The idea of being able to make one more thing that isn’t store bought is exciting! I want to make soda’s! All of them! I’ve experimented with flavors since I have a soda stream but now I want to do the actual fermentation as well. Oh — I forgot to mention: I’ve been making my own hard cider (10 gallons at a time!) for several years now. I’ve got a whole how-to series on my blog that you might want to consult in addition to Emma’s instructions when you decide to try it. Wow! I can’t wait to pick up some rhubarb at the farmer’s tomorrow to try this! This rhubarb soda sounds great. 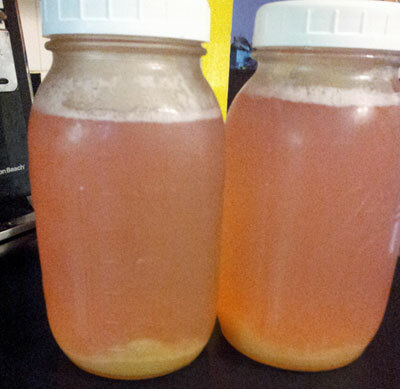 I tried my hand at wild fermented ginger beer, but grew some nasty slimy mold instead. I think I may have a better chance with commercial yeast. I’d love to win the book, but even if I don’t, thanks for the soda recipe! Just beginning to try my hand at brewing. Beer and cider so far but a new world of fermentation is opening up to me and I’d love a copy of True Brews to further my new obsession. I’m using the rubarb growing in my whiskey barrel to make this delicious sounding soda this weekend! I’ll let you know how it turns out. I’d make watermelon soda with the kids. Pretty sure they would love it. And thanks for the twitter reminder…I forgot to enter. about how long should you leave it out before you put into the fridge? No plastic bottles here!